No need to stop at the local bagel shop! These honey wheat bagels are easy to make at home. Mix in chocolate chips or raisins to recreate your favorite flavors. In the bowl of your stand mixer, whisk together the bread flour, salt, and yeast. In a liquid measuring cup, stir together the warm water (approximately 120-130°F) and honey. Add the liquid to the mixing bowl. Fit the mixer with the beater attachment, and beat for 2 - 3 minutes on medium-low, until the mixture is smooth. Switch to the dough hook, and gradually add the white whole wheat flour. Add about 1½ cups and let the dough knead on the slowest setting for a minute or two. If the dough still seems very sticky, add up to an additional ½ cup of white whole wheat flour. Continue to knead the dough until it forms a smooth ball, an additional minute or two. Transfer the dough to a lightly greased bowl and cover with a damp towel. Let the dough rise in a warm place until it has doubled in volume and the imprint of two fingers remains when pressed lightly into the dough. Once the dough has risen, punch it down and transfer it to a lightly floured surface. Divide the dough into 8 equal pieces. Cover again with the damp towel and let the dough rest for 10 - 15 minutes. While the dough rests, prepare a baking sheet with a piece of parchment paper or a silicone liner and set aside. Preheat the oven to 425°F. 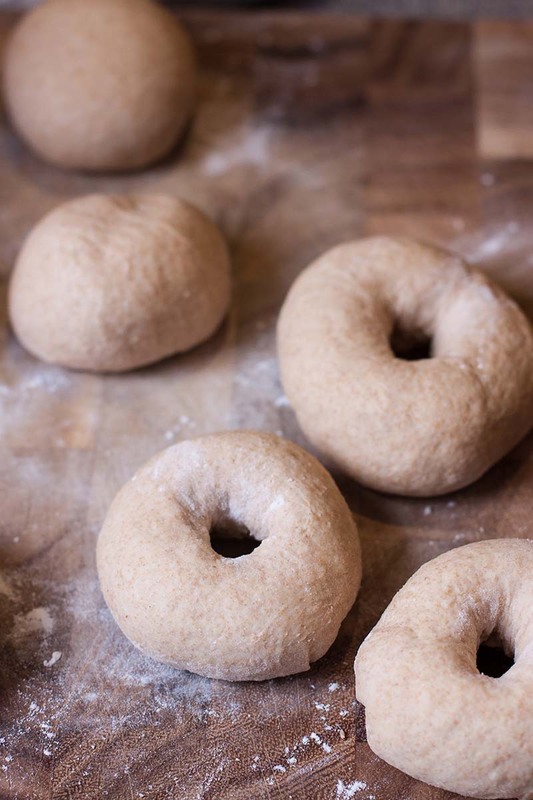 After allowing the dough to rest, shape each piece into a smooth ball and then press your thumb down into the center of the ball to shape the dough into a bagel shape. Transfer the bagels to the prepared baking sheet, and cover the bagels again to let them rest for an additional 10 minutes. Meanwhile, bring a large pot of water to a boil, and add a teaspoon or two of honey to the water (optional). Gently place the bagels into the boiling water, a few at a time. Let the bagels boil for 90 seconds before flipping them over to boil on the other side for an additional 90 seconds. Transfer the bagels back to the prepared baking sheet. Bake the bagels for 20 minutes. Let the bagels cool on the baking sheet for about 5 minutes, then transfer to a wire rack to cool completely. Want to add some mix-ins to your bagels? It’s simple! Before dividing the dough into 8 pieces, simply flatten the dough into a rectangle roughly 10 inches by 16 inches. Sprinkle your mix-ins (cinnamon, raisins, dried blueberries, chocolate chips, etc.) on the dough and then roll it up into a long roll. Then, cut the dough into 8 even portions and let it rise before shaping the bagels.